so the next week we decided to meet again and this time invited friends, other women we knew in our neighborhood that were also in Mama-la-la land. And VOILA! our Moms in the hood group came into being. 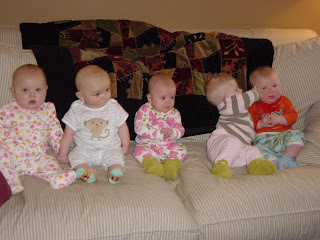 This is a picture of Annikah's friends. We (the fab mommies and babies) meet each Friday to decompress, talk, laugh at the antics of the bambinos, and just feel sane. They are in order from oldest to youngest in this picture. Anni is the oldest (and wisest :) of the bunch followed by Elliot (he and Anni share hairstylists, do not mock remember bald is beautiful, his parents were so kind to have me over to dinner when Jason was out of town on business and Elliot proudly sat in his pink Bumbo seat- that takes a very secure man), Gillly (she is an amazing miracle as she was born early, she is so big now compared to that first time we met her at Starbucks and fabulously brilliant), Francie (Anni totally digs her hair and is jealous of the way she rolls, as you can see she is the groper of the bunch :), and Angus (he is hilarious as he screeches and smiles at Anni, we think he has a little crush on her (and who wouldn't? he must like junk in the trunk) We may allow him to court her , although he might be a little wild for Anni as his dad is a rocker. We shall have to see. Anyway, thought I would share Anni's friends. Not pictured are the awesome women I get to share time with each week.